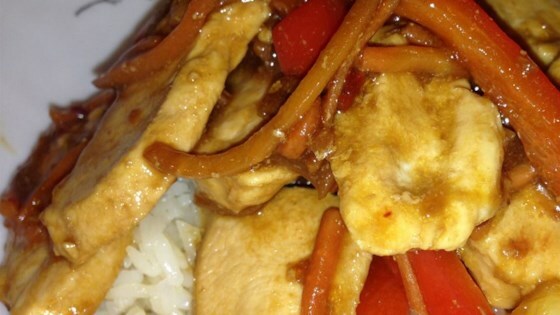 "This sweet and savory dish is prepared wok-style. You can substitute the chicken for pork if you like. Serve it over rice. I hope you enjoy!" Heat the oil in a wok or large skillet over medium-high heat; cook the chicken and carrots in the hot oil until the chicken is no longer pink in the center and the carrots are tender, about 5 minutes. Stir in the garlic and ginger; cook another 1 minute. Add the shallots and bell pepper; cook another 1 minute. Whisk together 3 tablespoons of the reserved liquid from the canned pineapple chunks along with the pineapple chunks, the water, soy sauce, cornstarch, vinegar, and pepper flakes; stir into the chicken and vegetable mixture and bring to a boil, stirring until the sauce thickens. Great! Lots of flavor with limited ingredients! I added a bit of curry powder too.